One day, while collecting rocks on the beach, a little girl named Nae-Nae discovers something amazing. It is a face on a rock gazing up at her. The more Nae-Nae looks, the more faces on rocks she finds. 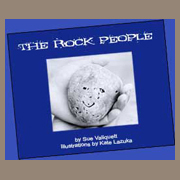 Through a family legend, Nae-Nae learns she’s discovered the Rock People who are here to heal and protect the Earth.